WFUV Listeners LOVE Indie Rocker Chapell!! Eric Holland, a celebrated radio DJ and television personality, will be hosting the NYC Indie Rock Festival 2017 this September 8th at the Bowery Electric. Acclaimed Indie Rocker Chapell will be headlining the festival. Fieldhouse / BMG artist Chapell is set to headline the 2017 Indie Rock Festival. Fans will enjoy a preview of music from Chapell’s follow-up album to the critically acclaimed Redhead’s Allegations, produced by Jerry Harrison of Talking Heads, Joining Chapell at the festival will be power pop band SlyBoots which is fresh off a hugely successful tour of the UK which included headlining the International Pop Overthrow Festival in Liverpool. 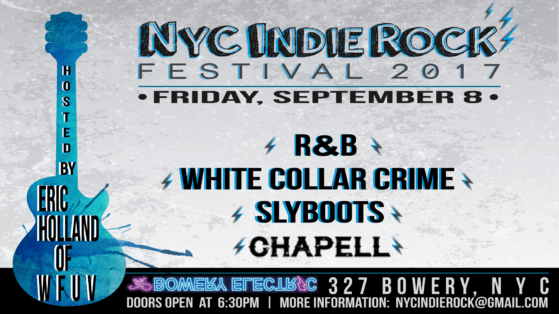 The lineup also includes smash rockers White Collar Crime and one of more unique acoustic acts to haunt NYC lower east side over the past decade, the infamous R&B. For more information, or to join Chapell’s mailing list, please contact info@ThisIsChapell.com.